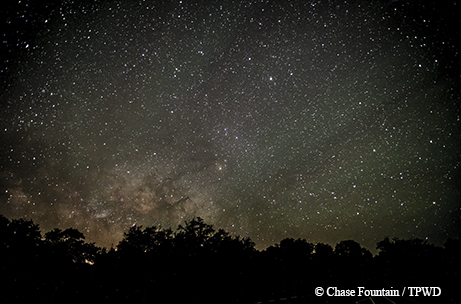 South Llano River State Park is the third Texas state park to be designated as an International Dark Sky Park, joining Copper Breaks State Park and Enchanted Rock State Natural Area as places where the stars shine bright. “The park has set a leadership example in pursuit of dark skies and quality outdoor lighting we hope others in Texas and around the world will look toward for inspiration,” says J. Scott Feierabend, International Dark-Sky Association executive director. Located 5 miles from the nearest town, South Llano River State Park ranks as a 3 on the Bortle Scale, which ranks skies from 1 to 9, with 1 being the darkest skies and 9 being the least dark. The darkness at the park provides visitors with a spectacular view of the stars. As part of the dark sky initiative, a stargazing tab was created on the park’s webpage; resources found there include a clear sky chart and real-time dark sky monitoring from the park’s permanently installed Sky Quality Meter. Local astronomers and park staff will partner with the Mason Star Gazers, a regional astronomy club, and Texas Tech University at Junction’s Outdoor School to provide park star parties, where visitors can learn about the importance of dark skies to wildlife and people. Which Texas City is the Wildest? Cities across Texas and the nation will compete this month to see which one can boast having the most species of wildlife. Want to participate and help your city win? Grab your smartphone and head outdoors! The City Nature Challenge, April 14–18, takes place in Dallas/Fort Worth, Austin and Houston. It’s easy to participate by joining an event or just making observations on your own, using the iNaturalist app. Just take a picture of a plant or animal and post it to iNaturalist, and the online community will help accurately identify the species. Any observation in the greater metropolitan area of each city will count during the five-day challenge. You can explore the life in your backyard, in your local park or on a field trip with your local group or club. TPWD, the Audubon Society and many others will be joining in this fun challenge. Go to www.tpwd.texas.gov/naturechallengeto watch the leaderboards or learn more about how you can participate. Get a thrilling look at the masters of the sky — raptors — at Lake Livingston State Park’s Birds of Prey program April 1. Presented in partnership with EarthQuest, an environmental education nonprofit, live birds of prey (including falcons, hawks, eagles and more) will be on display under the guidance of a trained falconer. These formidable birds will demonstrate their hunting prowess as they effortlessly soar and dive at speeds of more than 150 mph. Between the 10 a.m. and 2 p.m. presentations, a falconer and ranger will be on hand to take photos, answer questions and share information about the birds. EarthQuest offers this experience at no cost to park visitors; donations to further its educational and rescue programs will be accepted. Regular park entrance fees of $5 per adult apply. Children 12 and under are free. TPWD’s Artificial Reef Program sank a 371-foot cargo vessel on Jan. 20. Dubbed the Kraken after the mythical, squid-like sea monster immortalized on film and in literature, the vessel was sunk 67 miles off the coast of Galveston to create a new artificial reef. Over time, this sunken ship will attract fish, coral and other invertebrates as well as divers and anglers.